The pool at Finch Bay Eco Hotel. Photo by Johanna Read, TravelEater.net. In a unique and fragile place like the Galápagos Islands, every hotel needs to take precautions to protect the environment. Galápagos is a protected UNESCO site, and humans are allowed to build lodging on only three of the 20 islands, and only in very specific places and according to very specific rules. Some hotels go above and beyond those rules —­­ welcome to Finch Bay Eco Hotel. One of the rooms at Finch Bay Eco Hotel. Photo by Johanna Read, TravelEater.net. ● It is the only Puerto Ayora hotel with its own water treatment plant —­­ it desalinates water from a natural brackish source 3 kilometers away, and collects rainwater for purification too. ● They’ve planted over 500 mangroves to replenish the mangrove forests. ● Energy saving is the norm, with solar panels, movement sensors and other eco-technology. Rooms have extra insulation to minimize air conditioning needs. ● Soaps, detergents and shampoos are environmentally-­friendly and biodegradable, without a plastic mini-­bottle in sight. ● Waste is composted and recycled wherever possible. ● The hotel has its own herb, fruit and vegetable gardens to minimize shipping of food from the mainland. ● Guests are given useful tips about how they can reduce their environmental impact both at the hotel and when they return home. This 27-­room hotel is in Puerto Ayora, the main town on the Galápagos island of Santa Cruz. Finch Bay is a short distance away from the touristy shops and restaurants of “downtown” Puerto Ayora. A baby sea lion. Photo by Johanna Read, TravelEater.net. To get there, you take a 3-­minute boat ride from the main pier (watch out for sleeping sea lions!). The hotel has its own panga to take you, or a water taxi will drop you across the bay for about 60 cents. From there, you take a 5-minute walk, largely on a boardwalk, through a mangrove forest and by a pretty crescent beach. The 27 rooms at Finch Bay are well designed with lots of closet space. The standard rooms surrounding the mangroves are great although on the smaller side; the upgraded rooms are more luxurious and have views out to sea. The hotel is so well-equipped ­­with a large pool, great restaurant, and a hammock outside your room, ­­you may not want to leave the premises. You will be tempted, however, by the hotel’s day cruise yacht. 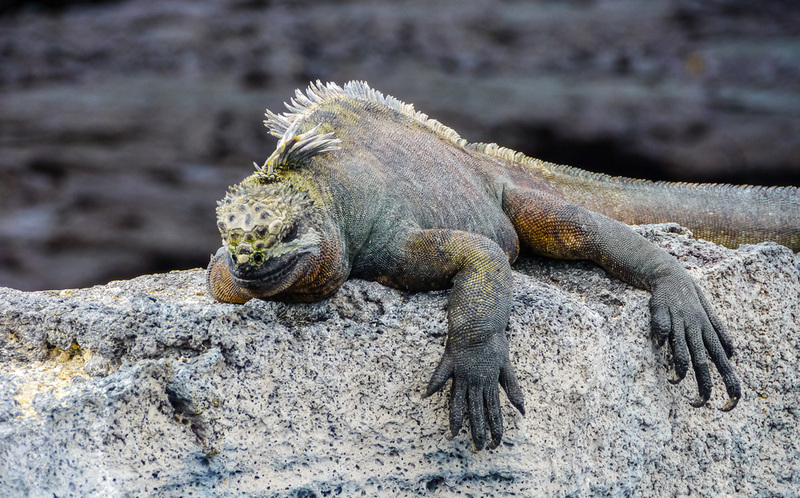 It goes to a different island every day so you can photograph Galápagos’ diverse flora and fauna, such as land and marine iguanas, sea lions, tortoises, flamingos, Sally Lightfoot crabs, and the scarlet sesuvium succulents and prickly pear cacti of South Plaza Island. Sometimes the sea lions hang out on the hotel’s beach though, so you really have no need to leave. A land iguana. Photo by Johanna Read, TravelEater.net.